This is one of my favorite dishes of my childhood. My mom used to cook it for me and my sister all the time. Cut the kabocha into half and scoop out all the seeds. Cut each half into large pieces and trim the edges. In a pot, place the kabocha pieces and water. Water should just barely cover the surface of the kabocha. Bring the mixture to boil, reduce the heat to low. Cover the surface with the parchment paper and close the pot with a lid. 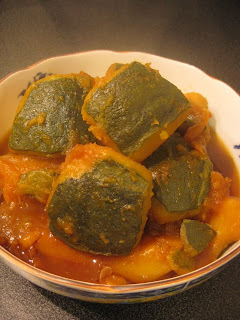 Let the ingredients to simmer for about 10 minutes or until the kabocha is tender. Discard half of the cooking liquid and the parchment paper. Add the sugar and soy sauces. Continue to cook the kabocha for another 5 minutes or so. Adjust the seasoning by adding a little amount of salt. Add the yuzu rind (optional) 1-2 minutes before the end of the cooking. This dish can be enjoyed either hot or at a room temperature.